Every film critic should spend at least a couple months working in a movie theater. Heck, every film buff should spend at least a couple months working in a movie theater. If you love movies, there’s nothing quite like being in an environment where you’re surrounded by them. Lately, I’ve been indulging in a little nostalgia, reflecting back on the summer of 1989, when I spent three months working at my local Fox Theaters. I’d just turned 21, was home from college for summer break, and had recently scored my first paying gig as a film critic, earning a whopping $3.00 per week penning reviews for my local newspaper. Since I was 16, I had worked at the drug store in the mall. Initially, I was a stock boy, which was kind of fun. But then, because I was “responsible,” I got moved up to cashier, which was boring. Standing behind a cash register all day wasn’t for me. Needing something new and different, I applied at the theaters, which were also in the mall. They hired me. My first night there was simple: I ripped tickets. It was a Thursday night, right before the summer movie season officially kicked off. The place was mostly empty, with only a few stragglers coming in to see the last remaining shows of Pink Cadillac, Road House, and See No Evil, Hear No Evil before the big summer movies took over. At the end of my shift, I was allowed to go into the back room and take any old movie posters I wanted. I grabbed more than a few, and they decorated my college dorm room the next year. Fox Theaters was your typical mall four-plex, built in the late 1970s. The auditoriums were nothing fancy, just shoebox-type theaters with decent-sized screens. You had to walk down a little offshoot of the main mall thoroughfare to get to them, or you could cut through the Space Port, the L-shaped arcade that was right next door. There was a gate at the theater entrance, so when it was time to open, we’d have to take a massive crank and attach it to an opening in the ceiling, then turn it repeatedly to lift the gate. It was incredibly tiring on the arms. Once the gate was up, patrons would take two steps forward and order their ticket from the box office. Then they’d take three steps to the left and order concessions. 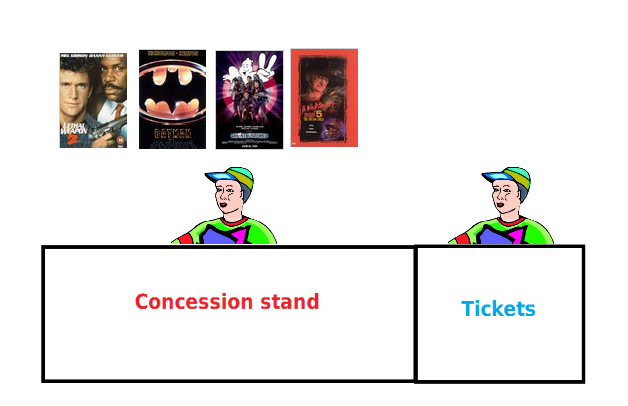 (A mini concession stand was located between theaters Two and Three, for use at busy times.) On the wall behind the concession stand were four poster frames that had one-sheets for the movies currently showing, so that people would know which theater to enter. I loved climbing up there to change them. It didn’t take long to really get back into the job. There were irresistible little pleasures, like holding my hands under the popper when the popcorn came out. We’d all grab the stuff and shove it into our mouths when it was piping hot. I’d never been a big popcorn eater before that summer. I grew to love it – and gained a few pounds in the process. Seeing people I knew coming in to view particular movies was also fun, and the breaks were a good time to do “theater checks.” When things were slow, I’d sneak into one of the theaters, ostensibly to make sure the picture and sound quality were okay. Actually, I’d be watching movies – re-seeing especially awesome parts of movies like Tim Burton’s Batman or absorbing films I hadn’t yet seen in pieces. To this day, I’ve never seen A Nightmare on Elm Street 5: The Dream Child from start to finish, but I have seen the whole thing in non-sequential chunks. The summer of 1989 was massive for movies. In addition to Batman, it was the summer of such blockbusters as Ghostbusters II, Lethal Weapon 2, Indiana Jones and the Last Crusade, Turner & Hooch, Parenthood, Field of Dreams, When Harry Met Sally… and Honey, I Shrunk the Kids. Because I worked Friday and Saturday nights – peak moviegoing times – my first task was ushering. This concept doesn’t really take place in theaters anymore. Now, we have multiplexes with a dozen or more screens. Highly-anticipated new films can play in multiple auditoriums to accommodate the crowds. With only four screens at the Fox, there was no doubling up. A different movie was on each of the four screens, and when one of them sold out, it sold out. My task was to help latecomers find seats together, ask people not to leave unoccupied seats between them, and so on. This often took place while the previews ran, so it was a great way to stay up-to-date on all the new trailers. Sometimes I had to split people up, putting one parent in an empty seat in the back and the other parent and a child in two vacant seats in the front row. One way or another, they got seated. Of course, pranks were occasionally played, and while cleaning out the theaters one Saturday night, a couple of us decided to prank a coworker. First, let me tell you about Herm. He was an amazing guy, a few years older than I. A longtime fixture of the theater before I even got there, Herm was the lead ticket taker. He had palsy in one hand, so he could only use the other one to rip. After taking someone’s ticket, he’d press it against his leg, tear it in half using two fingers, then hand it back. He was so accomplished at this process that he could rip tickets faster than any of us with use of both hands. Another really great person who worked at Fox was the manager, Andy. He was what those in the clothing business would refer to as “big and tall,” and he had a boisterous laugh. Andy was also one of the most generous people I’ve ever met. If someone he knew and hadn’t seen for a long time came to the theater, he’d often let them in for free and instruct us to give them the VIP treatment. Andy liked the junk food. Many a time, he would come out of his office, reach into the concession stand, and pull out a four-pack of Reese’s peanut butter cups. He would shove a whole cup into his mouth, and continue like this until they were gone. While he is one of my favorite people I’ve ever known, Andy could also have an occasional temper tamtrum. Occasionally, he would yell at somebody. No one ever seemed to mind it, which initially puzzled me. One evening, he asked me to fill the soda machine with crushed ice. I did as instructed. When he came out to inspect, Andy yelled and swore at me for not getting ice cubes, which is what he’d meant to tell me to do. I didn’t get angry because, by this point, I realized what everyone else already knew: this was just something he would do when he got frustrated by whatever operational stuff he was dealing with in his office. It wasn’t at all personal. He simply needed to let off steam. About half an hour later, he called me off the floor and into the office, where he offered me a seat and began joking around with me. This was his way of apologizing. The other thing I remember vividly about Andy was that he dated strippers. I know this because he’d sometimes bring them into the theater to meet us. These women would be introduced as his “lady friends.” Later, after they’d left, he would conspiratorially lean in and whisper to us guys, “She’s a stripper!” It was no surprise that they liked him in return. Andy never treated them like strippers, he treated them like ladies. When they came in, he proudly introduced them to everyone and made a point of having us make them feel welcome at the theater. He was a total gentleman in their presence. Working at Fox Theaters was a fun job. I got to see lots of people I knew, worked around a couple of cute girls I developed crushes on, and was surrounded by movies. I got to do cool things like change the marquee out in front of the mall, switch out the posters, watch previews, and help people find seats. From time to time, there were small problems, of course. On Friday and Saturday late shows, a couple people inevitably arrived drunk. I vividly recall a patron frantically running out of the theater showing Field of Dreams and darting into the bathroom. A minute later, another man came out to ask for a refund because the first guy had puked inside the auditorium. Andy told me to check it out. Upon opening the door, the unmistakable aroma of alcohol-laden vomit filled my nostrils. It was glaringly apparent where the offender had been sitting: right-hand side, halfway down. Everyone else in the fairly crowded theater was sitting either on the left-hand side, or at the very front or very back of the right side. Stopping the movie wasn’t practical, so anyone who wanted to leave was given a pass to come again another time. Thankfully, I got off early that night, so somebody else had to clean the mess up. At the end of the summer, I went back to college, leaving Fox Theaters behind – although I returned often as a patron when I was home for weekends or holidays. A year later, I went off to graduate school in Shippensburg. A few miles down the road, in Chambersburg, there was an older, sort of run-down four-screen theater called the Southgate. (If you’ve read my book, Straight-Up Blatant, you know the place I’m referring to.) I went there one day in the fall of 1992 to see Cameron Crowe’s Singles and was surprised to run into Andy, who was just as surprised to run into me. It turned out that the Fox chain had been purchased by Manos, and he’d been transferred. True to generous form, he handed me a stack of passes, good for both the Southgate and the fancier theaters at the Chambersburg Mall. “When you run out, let me know and I’ll give you some more,” he told me. That was Andy: he knew I was a poor student, so he made sure I got into the movies for free. This allowed me to pocket the $3.00 a week I was earning from the newspaper. I saw Andy off and on at the Southgate over the next year. After graduation, I moved back to my hometown and never saw him again. A few years later, news arrived that he had passed away. There were several differing accounts of what happened. Some people claimed that he’d become ill, had no health insurance, and died because he couldn’t afford to get treatment. Others said it was a heart attack, brought on by his weight and poor diet. Herm said it was the latter, and I believe him. That’s because Herm knew everybody. He went on to work at the local driver’s license center, so I saw him every few years when I went in to have an updated picture taken. To my amazement, Herm knew where everyone from the theater was and what they were doing. (I guess he got updates when they, too, came in for a new license.) He knew who was married, what everyone did for a living, where they lived, etc. He remembered the name of every single person who worked at the theater, too. “Hey, remember that one guy?” I’d say, and he would tell me the guy’s name and give me a brief update on what he was up to. You could count on Herm for the news. Sadly, Herm is no longer with us, either. He died in 2005. I never did get the full details on what happened. I just remember feeling really sad when I heard of his passing. He was one of those people it was impossible to dislike. Just an all-around great guy with a wonderful, good-natured – if occasionally sarcastic – spirit. As for Fox Theaters, they’re still there. Kind of. 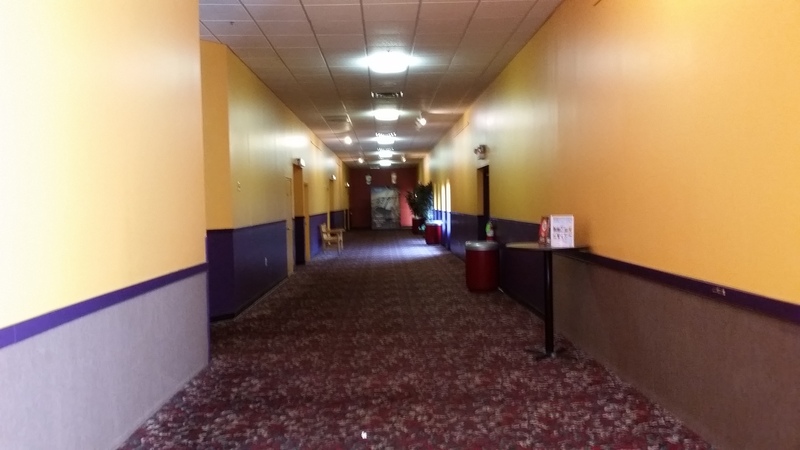 After the Manos purchase, they were sold to Carmike in the mid-’90s, then closed down in 2000. A year later, a family run company, Cinema Center, bought and completely renovated them, eventually building a beautiful extension with an additional eight auditoriums. Digiplex Destinations bought the theaters from Cinema Center a little over a decade later, and about a year-and-a-half ago, they were sold again…ironically, to Carmike. On a fairly regular basis, I end up in one of those original four auditoriums. 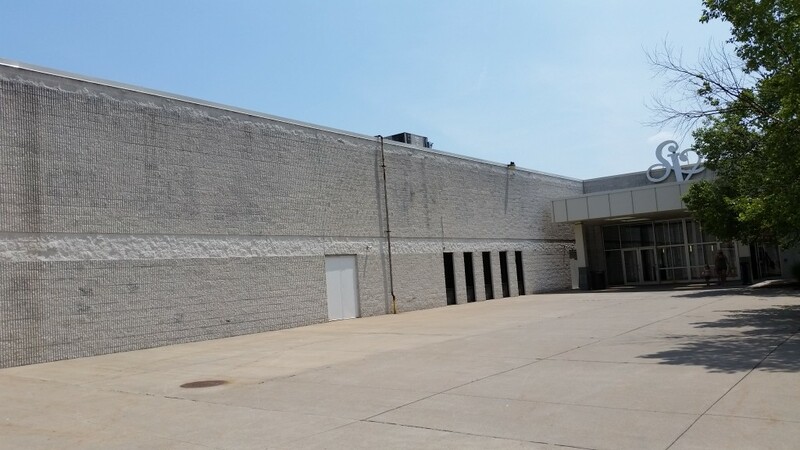 They don’t look the same anymore, but it’s the same space where I watched so many movies growing up, and where I worked for one magical summer. I’m glad to have this connection to my moviegoing past. Whereas many other theaters from that era have been torn down, the Fox Theaters remain. They are changed and improved, but they still stand, and my heart warms a little bit whenever I watch a movie in one of them. The original four Fox Theaters as they appear today. Auditoriums are all on the left. The box office was behind where the far wall is now. I took this picture from what used to be the end of the theater. The eight-screen expansion is behind me.